As part of ATL Bite Life's Soul Food Month, I've been on a quest to discover some of the hidden soul food gems in the city. Funny thing about looking for "hidden" restaurants though. They're never actually hidden. You just don't know about them. Case and point, Southern Art & Bourbon Bar. Interestingly enough, I'd been meaning to stop by this place for quite some time. I've actually mentioned Southern Art on this site a couple times. 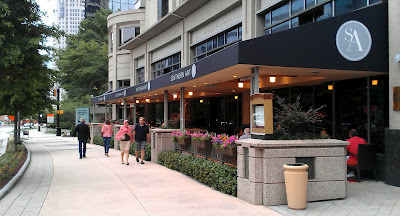 Once during Hotel Restaurant Week (it's attached to the Intercontinental Hotel) and once again back in February while it was one of the featured restaurants during Buckhead Restaurant Week. It was really just a matter of time before we stopped in. But then the perfect storm happened. Soul Food Month met a 50% off deal from Scoutmob. Winner Winner Chicken Dinner!!! And chicken is exactly what I had. Let's take it from the top. 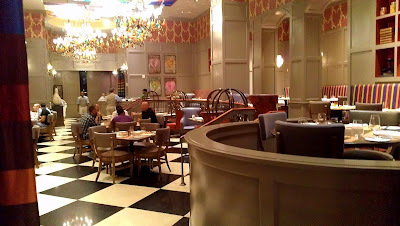 After parking in the main hotel deck and walking thru the gorgeous hotel lobby, I found my way over to the main entrance of the restaurant. Situated approximately 10 feet from a seemingly out of place ham counter (yes, a deli counter with pig carcasses hanging from the ceiling) was a pleasant hostess waiting to seat me. 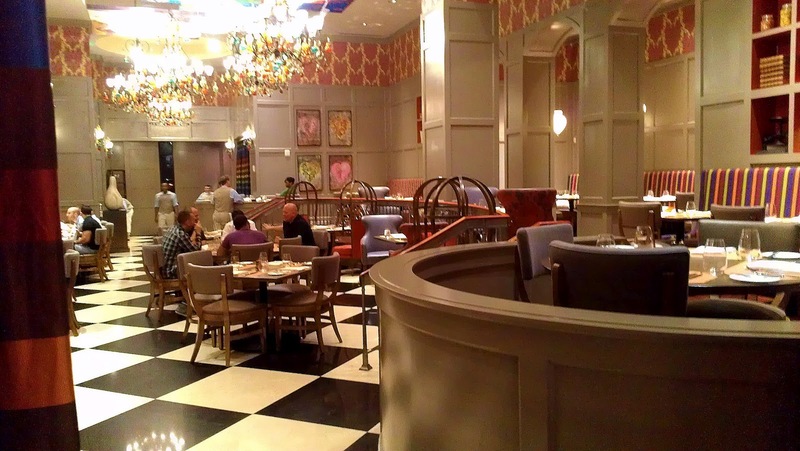 She pulled the curtain back to reveal a sprawling dining room and then guided me to my seat. The first thing that caught my eye was the kinda anitquey yet contemporary vibe of the restaurant. It was an understated fancy if that makes any sense. It wasn't overly impressed but it had an expensive "feel" that made me take notice. Also, there were these huge, colorful paintings hanging from the ceiling. 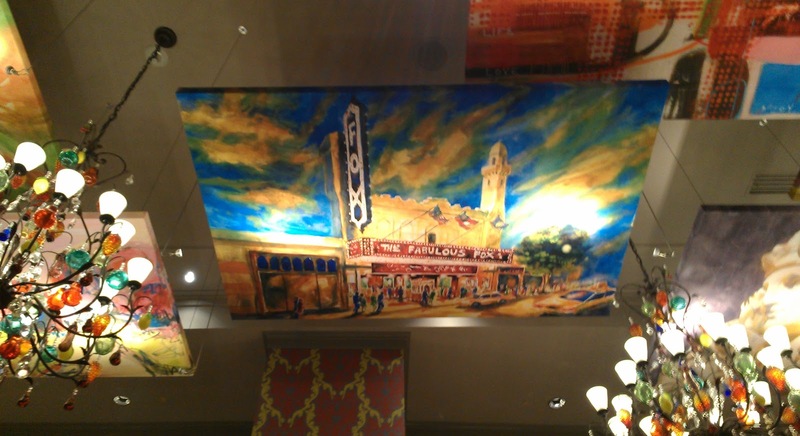 There was one beautiful portrait of the Fox Theater that really caught my eye (see above). But, I didn't come to see no art. I came to eat. 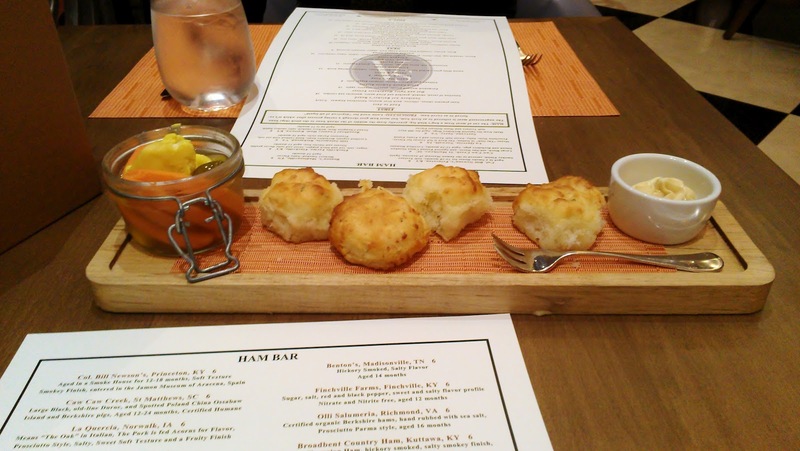 Much to my surprise, my table was greeted with some hot cheddar biscuits. My first thought - this is very Red Lobster-ish. Lol. However, the pickled vegetables in a jar that came with the biscuits fancied it right up. Have you ever had cauliflower and carrots preserved in a jar of vinegar?? Yeah, me either. It tasted exactly like you'd think. Pass. But, those biscuits were INCREDIBLE!!! Then came the main entrees. 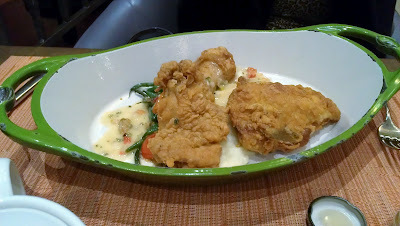 First up - the Buttermilk Fried Chicken (half a chicken - a thigh, breast, and a wing). It was served over mashed potatoes with green beans and a few other veggies mixed in. Delicious!!! Very well seasoned, very juicy, very sizable portion. My African-American side came out as I attempted to ask my server for a breast and two wings like I was at Popeyes but I dialed it back to in accordance with where I was. Lol. This was extremely tasty though. I even had some left over for the next day. Super win!!! Entree #2 - the Cornmeal Dusted Catfish. Let me admit, first, I'm not a huge catfish eater. I like it but it's rarely my first choice on a given day. I got it purely to keep within our Soul Food theme. But, I will say this - the Catfish was really good!!! It was draped over a very similar mix of potatoes and veggies and topped with bacon. Not bad at all. I guess my only negative would be that it was only ONE piece of fish. It wasn't filling to me but maybe, perhaps for a female, it would hit the spot. I did like it though. Overall, I really enjoyed Southern Art and I think you will too. 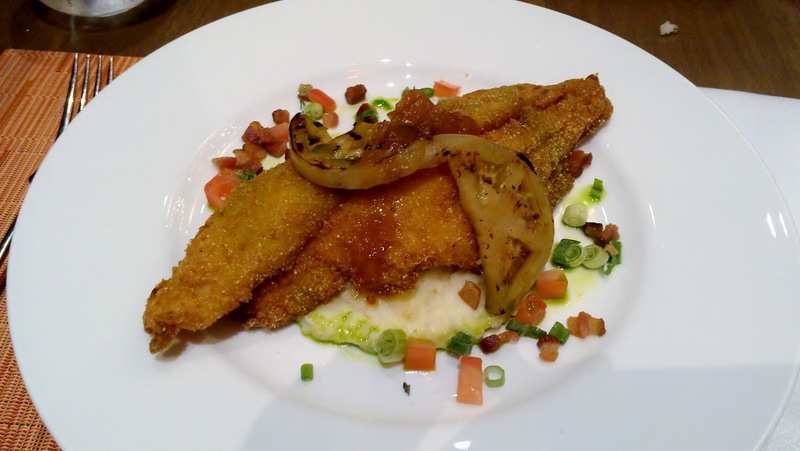 The food was good, the portions were decent, and the ambiance was perfect for date night. The only downside that I see, in particular for my urban audience, is the price and the portions. We all know that we could go get chicken and fish and vegetables from any soul food spot in the hood for $7 or $8. And, while Southern Art does not promote itself as a "soul food" restaurant, the touting of its' southern cuisine makes the comparisons a little easier to make. Either way, I say grab your girl and head on over and check it out. If it's good enough for Oprah, it's probably good enough for you.